WE HAVE TO BURN THE BROOM BECAUSE WE ARE NOT LAZY. 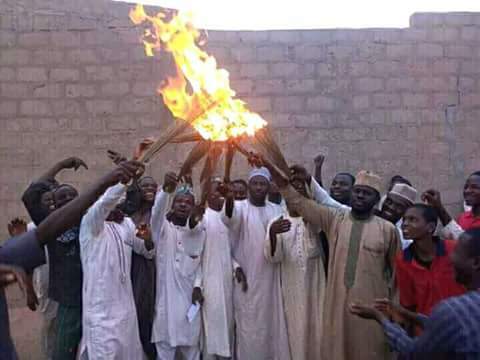 This Evening We did Operation Burning of Brooms In KANO STATE Ahead of 2019, Whoever that is Praising BUHARI for Calling Nigerian Youth Lazy will face the same music. BUHARI Has killed himself with his own Hands, Youth's across the Country will sacrifice even thier last drop of Blood to Boot BUHARI out from that seat. He is indeed Shameless to call us Lazy. All 36 States of the Federation should replicate this from Us because, It's Operation Start Burning the Brooms Because We are Not Lazy. Writes. All 36 States of the Federation should replicate this from Us because, It's Operation Start Burning the Brooms Because We are Not Lazy.